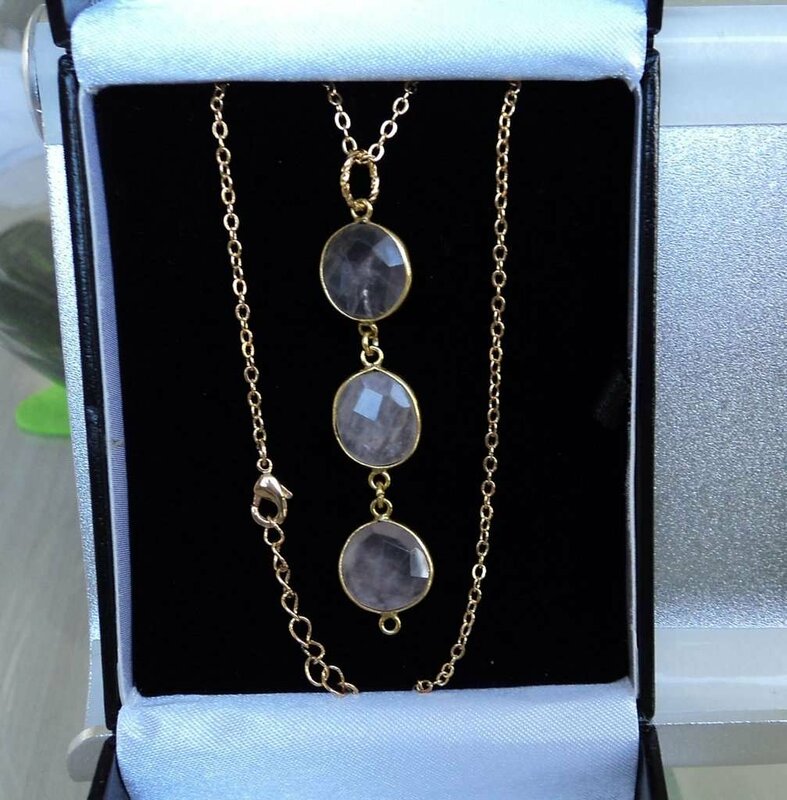 This pendant has 3 Rose Quartz crystals framed in Gold Plated Brass and comes with an adjustable 24 inch gold plated brass chain. Packaged in a stunning gift box. Rose Quartz is the stone of universal love. It restores trust and harmony in relationships, encouraging unconditional love. Rose Quartz purifies and opens the heart at all levels to promote love, self-love, friendship, deep inner healing and feelings of peace. Calming and reassuring, it helps to comfort in times of grief. Rose Quartz dispels negativity and protects against environmental pollution, replacing it with loving vibes. It encourages self-forgiveness and acceptance invoking self-trust and self-worth. The fair and lovely Rose Quartz, with its gentle pink essence, is a stone of the heart, a Crystal of Unconditional Love. It carries a soft feminine energy of compassion and peace, tenderness and healing, nourishment and comfort. It speaks directly to the Heart Chakra, dissolving emotional wounds, fears and resentments, and circulates a Divine loving energy throughout the entire aura. Reawakening the heart to its own innate love, it provides a deep sense of personal fulfillment and contentment, allowing one the capacity to truly give and receive love from others. relationships, understand their cyclic nature, and accept the changes.Rose Quartz also balances the yin-yang energy, and can bring all the other chakras into harmony and unity with the Heart. With the power of its light red rays, Rose Quartz gently stimulates the Base Chakra to help rejuvenate the physical body. Located at the base of the spine, the Base Chakracontrols the energy for kinesthetic feeling and movement. It is the foundation of physical and spiritual energy for the body. When it is in balance, the physical body gains strength and spiritual energy is rekindled in the form of security and sense of one's own power.